Make your Gossip Girl dreams come true! It's not surprising why many experiment with rustic and industrial interiors. These two add a distinct appeal to any space—a balance between edgy and cozy—giving the owners the freedom to style their homes with handpicked pieces and accessories. 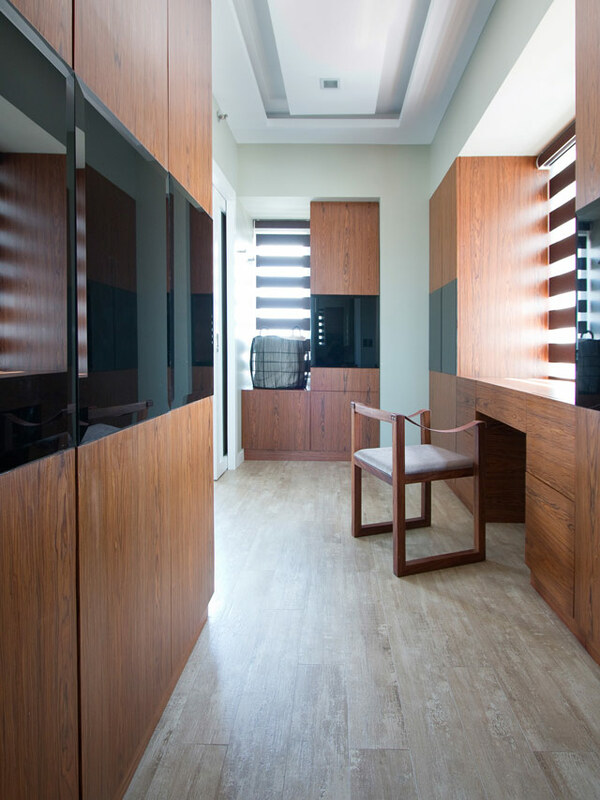 For this 70sqm unit, the owner wanted a clean and organized home with rustic touches. To achieve this look, interior designer Jen Sohu of Sohu Designs came up with a rustic minimalist theme—highlighting a neat aesthetic and worn-out finishes. "It exudes a finished yet unfinished look and feel, but with a homey ambiance," says Jen. The designer worked closely with the client to make sure that the unit will fit her lifestyle as well. Instead of retaining the two bedrooms, they opted for a bigger sleeping space and converted the other room into a walk-in closet. 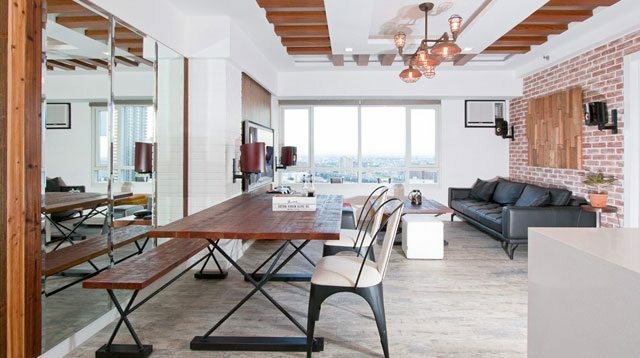 From the lovely dining area to the living area with a view of the city—this home will remind you of quaint coffee shops and the urban appeal of the Big Apple. 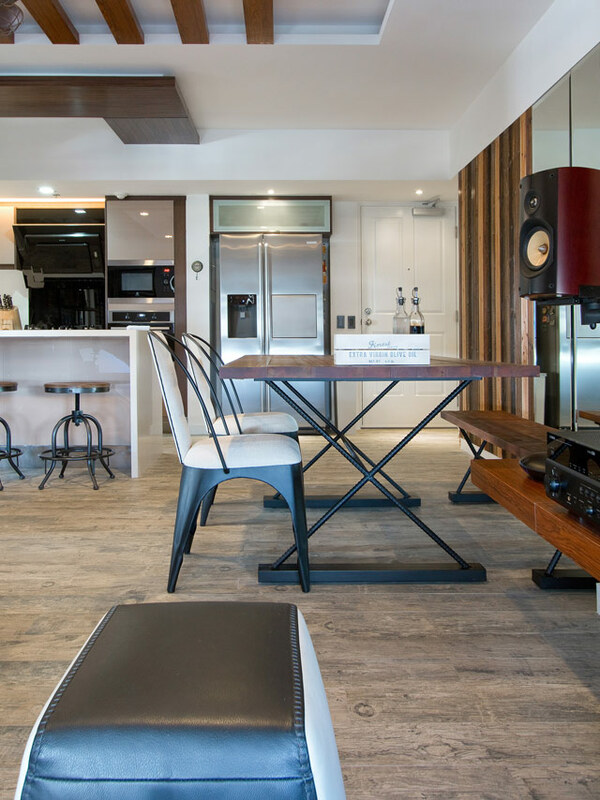 To achieve the rustic style the owner wanted, pepper-wood tiles were chosen for the flooring. These tiles can be seen in the living, dining, and kitchen areas. The walls were kept white to showcase the bricks and wooden pieces. Thick planks of wood also make the ceiling extra interesting. White and terracotta bricks complete the common areas—with the brick wall and wall installation behind the sofa serving as a focal point. 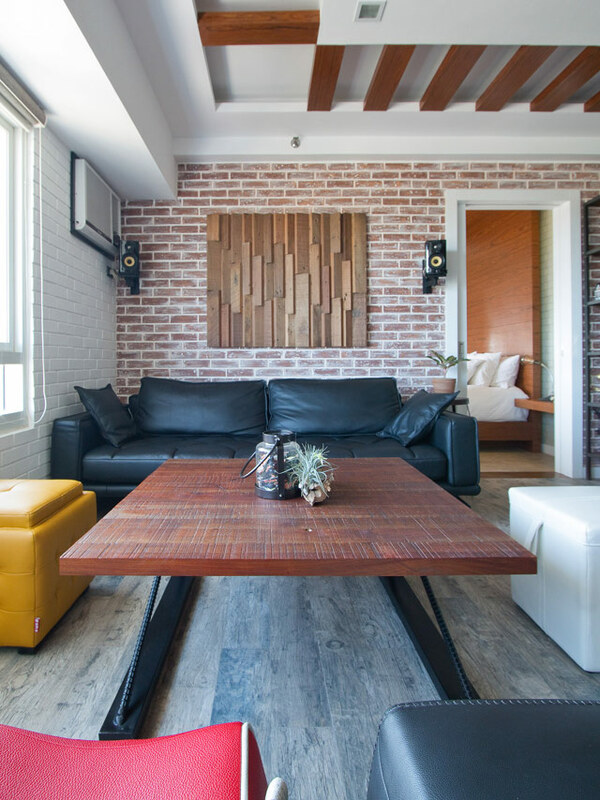 Pairing the chosen materials with a black sofa and colorful seating pieces give the space a relaxed, urban vibe. While the topnotch entertainment must-haves are enough to make guests stop and stare, it's the wall behind the TV that deserves attention. Jen used recycled newspaper as wallpaper for the TV wall. 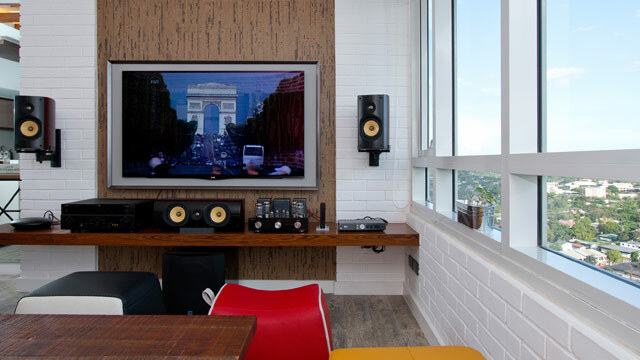 To achieve a movie house experience, wall-mounted speakers and extra cove lighting complete the look. The homeowners can also best appreciate the view of the city from the living area with its huge windows. To achieve a cohesive look, the pieces chosen for the dining and kitchen areas showcase wood and steel. The sturdy table with steel legs is paired with a bench and two cushioned chairs with the same base. A few steps from the dining area is the spacious kitchen equipped with handy appliances. According to Jen, one wall of the kitchen was torn down to make the space seem bigger as well as to accommodate a breakfast nook. The counter can be used as prep area as well an extra dining space with the addition of stools. Find similar pieces at Match Contract, ID Center 2100 Pasong Tamo Ext, Makati City. Follow them on Instagram. 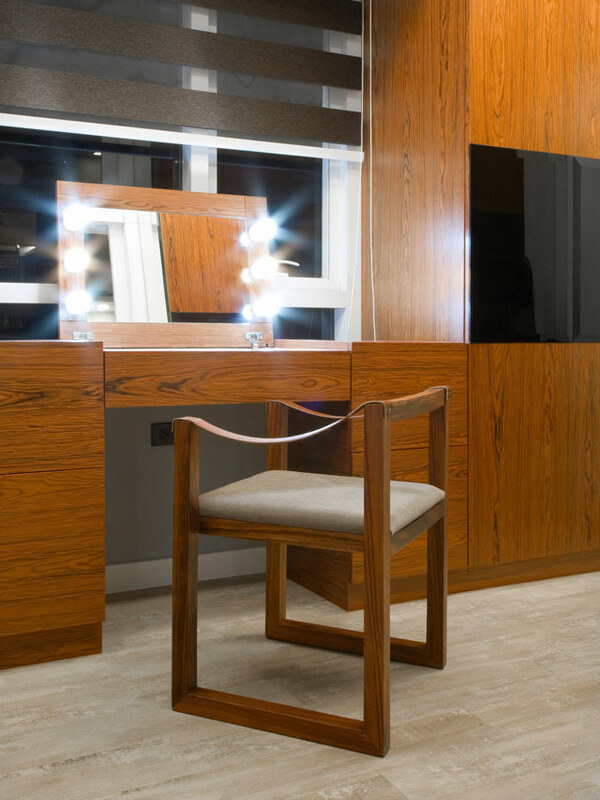 Aside from making the unit look bigger than it really is, the paneled mirrors also conceal cleverly added storage options. The same goes for the wooden accent panelâboth serve as doors to secret storage for food and other belongings. The unit's layout proved to be challenging during the renovation. The private areas were small and the master bedroom doesn't have enough space to accommodate a desk and a queen-sized bed. To remedy the situation, the walls of the second bedroom were torn down and a new wall that took up a part of the living area and hallway was built. Doing so made the sleeping space bigger and allowed the transformation of the second room into a walk-in closet. To create a space that's meant for rewarding slumbers, Jen used locally sourced bricks painted in French Gray. 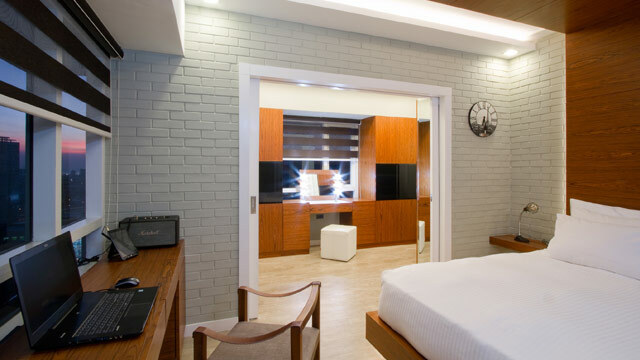 These bricks are paired with a veneer wood finish to achieve contrast as well as to echo the look seen in the common areas. Who wouldn't love the vibe of the bedroom at night? 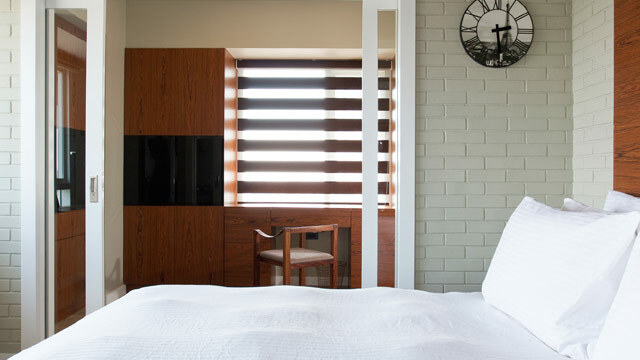 With a view of the city and a bed that's reminiscent of hotel suites, it's the perfect escape. Cove lighting sets the mood and makes the room extra cozy. Sliding pocket glass doors separate the bedroom from the walk-in closet. Aside from making it easier for the owner to move from one room to another, these doors also allow natural light to stream into the space and avoid a cramped look. For a chic and sleek walk-in closet, Jen opted for cabinets with veneer wood finish. Meanwhile, the graphicote glass accents add a modern touch. 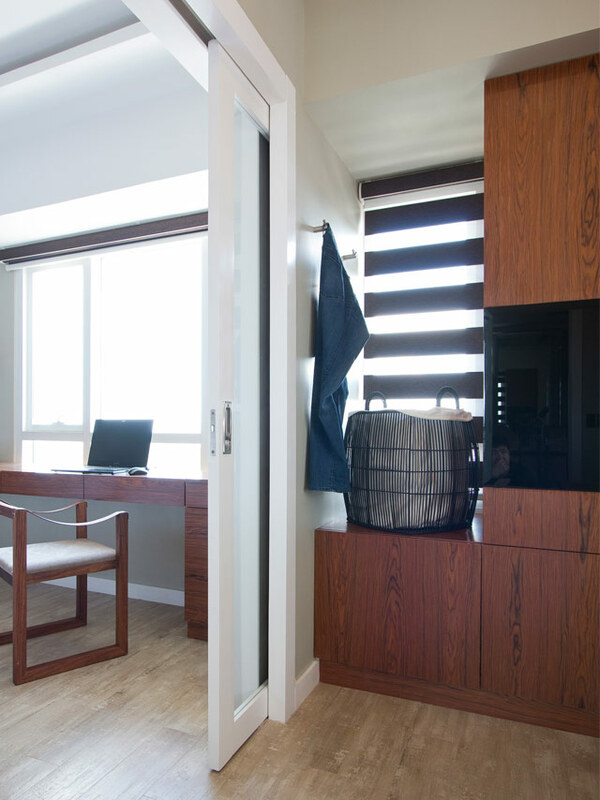 The walk-in closet also has a vanity nook with a folding mirror and a compact chair that can fit snugly under the table when not in use to save on space. In contrast to the other areas with wooden touches and brick finishes, the bathroom is kept clutter-free and functional. The fixtures and materials chosen speak of elegance while making the area look spacious. A futuristic pedestal sink shines in this bathroom with black floor tiles and textured walls. 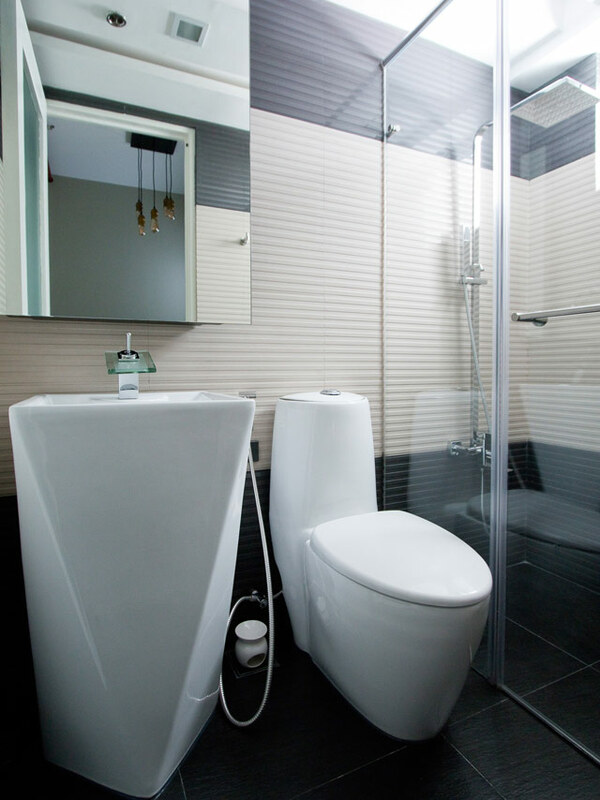 Using a glass shower enclosure opens up the space and keep it from looking too small. 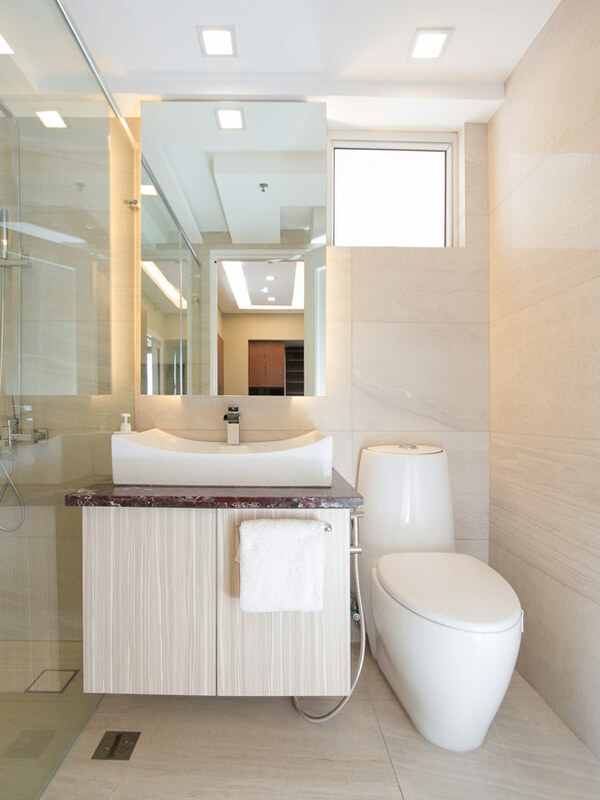 For similar sinks and quality bathroom fixtures, visit the Sanitec Main Showroom at 236 E. Rodriguez Senior Avenue Brgy. Don Manuel, Quezon City. 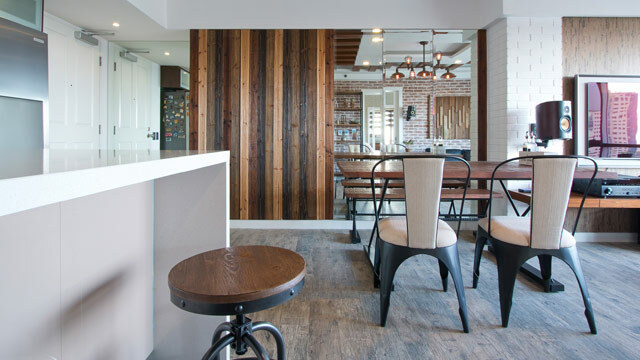 Sohu Designs is an interior design studio based in Quezon City. The firm has been working with various clients since 2009. 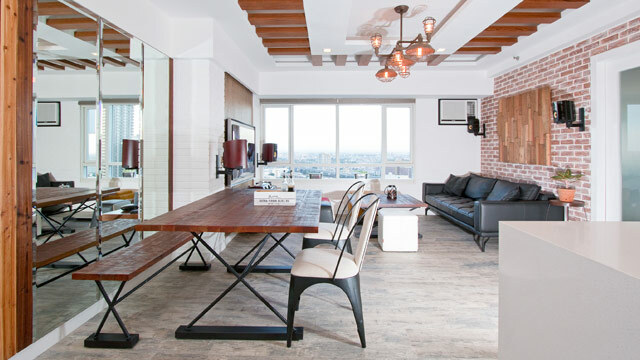 With interior designer Jennifer So Hu at the helm, they specialize in modern contemporary interiors. 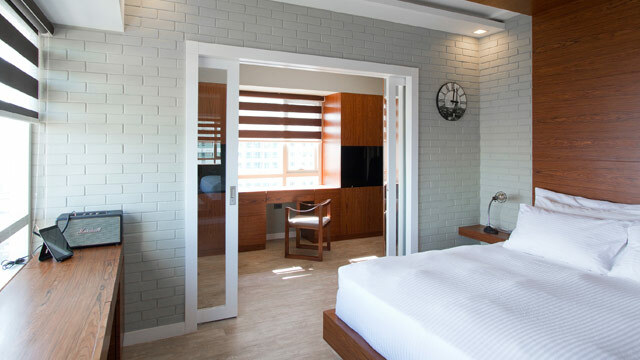 Known for design that speaks for itself, Sohu Designs can deliver a home that's timeless and functional. For more information, visit the Sohu Designs website. You can also follow them on Facebook or e-mail them at sohudesigns[at]gmail.com.